Early figures of Jinas or Tirthankaras (Jain saviour figures) resemble Buddha images in some respects, but lack the ushnisha or topknot on the head. Presented by Mrs Isa Cohn, in memory of Dr William Cohn, 1963. The absence of an uṣṇiṣa [see EAOS. 26] immediately distinguishes this head as having belonged to a statue of a Jina one of the saviours of the Jain religion [see EAOS.108], rather than the Buddha. 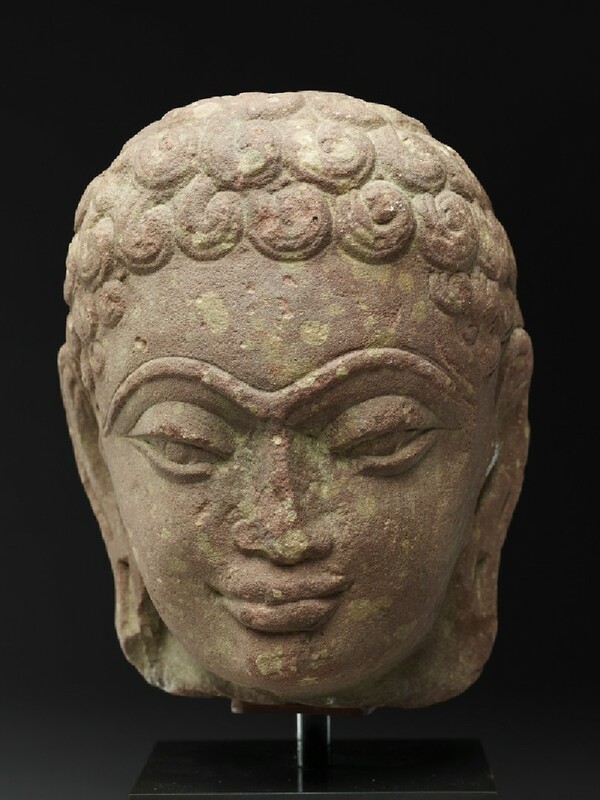 The style and the nature of the stone indicate that Mathura or an associated site was the source of this sculpture, and indeed Mathura at this period produced greater numbers of Jina images than Buddhas. The heavy raised unbroken line indicating the eyebrows, the eyes with their peculiar treatment of the upper lids and the pouting lips all indicate a third or fourth century date, in the late Kuṣāṇa period. A smile is just beginning to steal across the lower part of the face, just as the eyes are becoming almond-shaped, precursors of the “spiritual” expression of Gupta Buddhas and Jinas. This and numberless other such figures, often quite crude in execution, may thus be considered in a sense transition pieces.